Developed by the Guomao Group, who has complete independent intellectual property rights of a GMLX60-02 vertical mill gear reducer, is in the completion of the assembly. After testing, its performance targets are met or exceeded design requirements. With weight 17.5 tons, an input power of 600 kilowatts of this vertical mill gear speed reducer, there is another notable feature is the use of lower bearing disc rolling friction. According to the test results, compared with the use of sliding friction, the mechanical efficiency is significantly increased by 10%. 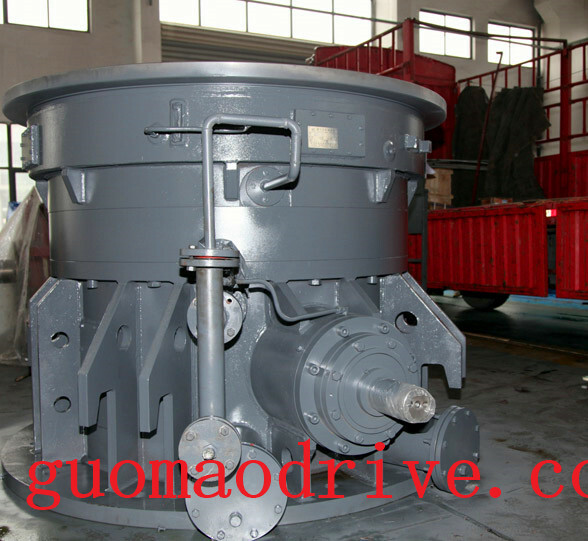 Successful production of such reducer, indicating GUOMAO series gear speed reducer has a big achievement. which will provide a strong new impetus to the development of Guomao Reducer Group for a higher grade. According to Guomao's technical experts engineer Zhang, this vertical mill gearbox, completely relying on the company's existing resources, the full integration of modern design and manufacture of the latest achievements, equipped with the world's most advanced hydraulic and lubrication technology, as well as multiple security , fully automated measurement and control technology - mechanical, electrical, fluid integration and operation of real-time security control security systems, to ensure that the large hydrostatic bearings and gears of reliable operation.